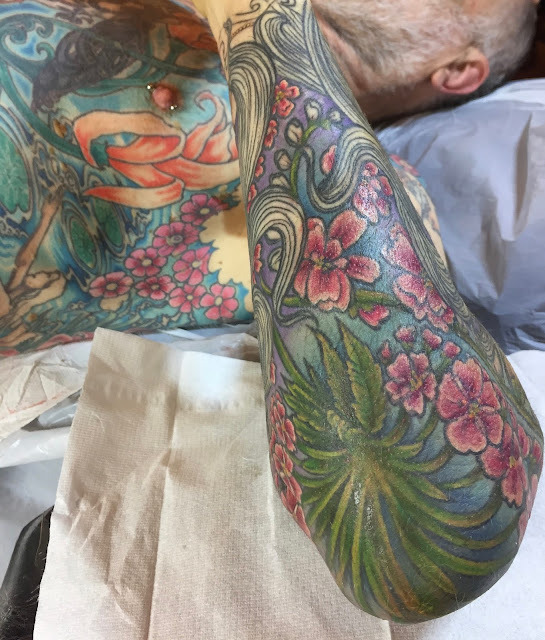 Unexpectedly I was able to take a cancellation from Ben today and he was able to complete the small extension to my sleeve. He than went on to do bits and pieces elsewhere to my right arm. It doesn't look that different but I am pleased it is now bigger and better. Tina and Jay Rill from the Inkwell 215 tattoo studio in Philadelphia. They live in nearby Southampton. My eyes quickly picked up on Tina's neck and her striking looks. I love the strength and confidence of the image along with her full sleeves and chest tattoos. Jay has a pretty similar approach on his own somewhat less visible neck tattoo. When I chatted to them at the London International they were like so many Americans extremely friendly and chatty. None of the aloofness that you sometimes get in the UK. A great couple. I made the longish journey up to Shrewsbury, where Jo Harrison has her studio at home. It's rather different from other studios I've been to, given it is also where she and her family live. I was greeted by her dog Benji. That was different. Then I sat down by their window that looked out onto their garden and the countryside beyond and ate my sandwich and the rest of my lunch. My last appointment was in June so this had been a long wait. I normally prefer to go to her Birmingham studio as it is just a one and half hour journey away. But this time I drove and took my wife and three Saluki dogs too as my sister-in-law lives near Shrewsbury. This gave Suzanne time to catch up with her sister and give the dogs a good walk in the Shropshire countryside. Here are some images from my latest session with Ben Boston. They were tidying up jobs involving the back of my left knee and adding an inch to my right arm sleeve so that it matches the length of left arm sleeve. No drama here, but I had to get a cancellation from Ben given that I have managed to get out of his bookings loop since I went to Jo Harrison to finish my left arm. I had a pretty relaxed time with Ben. No travel and a two hours session. Easy. Marta is quite new to tattooing but very self assured. She may or may not stay in London. We had a good chat about the possible impact of Brexit on young people like them. This didn't cheer me up. A pity we can't see any of his ink. As you might guess from his name. he is also Italian. And the third of the group is Lithuanian and annoyingly I can't remember his name. He works at West One Tattoo in Oxford Street. The big crowds gathered around the tattoo booths. Monami Frost, major tattoo celebrity. Tina Rill from Philadelphia and her amazing neck. This was my second time at the London International Tattoo convention. I like the fact I can go on a Friday. Here are a few of the people I met and chatted to. It seemed a little quieter than last year but still great. It felt like the majority of the people I met were from outside the UK or non-British and so it was with the tattooists. In every way the convention lived up to its name. Jamie Wintle is from Brislington in Bristol and had just had his new head tattoo done at Avon Tattoo by Jordan Ferris. https://www.facebook.com/JordanFerrisTattoo/ He'd been planning it for a while and Jordan found the script he was looking for and it was completed in three hours. In the next few weeks he'll get the other side of his head done. Jamie works at a car body shop so it's no problem getting visible tattoos. So they are getting tattooed together and seemingly getting their hair styles together. Let's hope their compatibility keeps them together. I was very surprised when I arrived at the Bristol Tattoo convention last month to see a stall dedicated to the British Tattoo Art Revealed exhibition at National Maritime Museum in Falmouth. I visited there on my holiday in April and was delighted a couple of months later to have the chance to meet one of the tattoo exhibition's curators, Derryth Ridge. She was one was one of those who set everything up and given that she has lots of tattoos it's not hard to see what motivated her. Sometimes you can spend a few hours being tattooed and there doesn't seem much to show for it. Jo Harrison just worked on colouring in the heavily line piece and as she dotted around doing background work the changes superficially didn't seem very dramatic. Most of the work was on the back of my arm, which normally I can hardly see. For some reason I struggled on this occasion. I had as usual used some numbing cream, but it didn't seem to have much effect. Normally I find it does. Anyhow, I survived the 3 and half hours session though felt rather sore, which is surprising given that the arm is one of the easiest areas to tattoo. I went to Birmingham again in May, five months after Jo Harrison had begun the lower left arm sleeve. This was to be the longest ever session I had had. It started at 9:30 am and at 4:15 pm I had to give up early. I couldn't make it until 5:00 pm. In the time available Jo had drawn on me the rest of the design, completed all the very detailed black outlines and then begun with the colour. While, the arm is probably the easiest area of the body to tattoo, later in the day my body strength weakened all of a sudden. I just couldn't cope with any area Jo tried to touch. A big disappointment. Next time I will limit myself to a half session. Here is Jo herself after she had finished for the day. This was my third visit to the Bristol Tattoo Convention and it seems busier than ever. I was there on the Sunday which is usually quieter than Saturday. Derryth Ridge was at the stall for the national Maritime Museum in Falmouth. That was something new. But very relevant given that they have the UK's biggest exhibition on the history of Tattoos in the UK. Felicity Tocher is a tattoo trainee at the Higgins and Co studio in Eastbourne. She has been working there for three years but last December picked up the needles and started the long process of becoming a trained tattooist. Jamie Wintle is from Bristol and had just had his head tattooed the previous day. Here he is with his partner Jodie. They both have the same haircuts! Bristol Tattoo Convention is for the tattoo purist. What is there is tattooing. No piercing, no roller blade races, no glamour models and fire eating. Just tattooing. While the main project over the coming months is to complete my left arm sleeve, Ben has progressed a little further down my left leg. Originally I had planned to take the diamonds right down my leg, but Ben has persuaded me otherwise. So after adding another band similar to that higher up my legs in green and yellow, then I will go for something different. I don't know what that will be yet.